Synopsis: After getting in a car accident, a woman is held in a shelter by two men, who claim the outside world is affected by a widespread chemical attack. Stars: Mary Elizabeth Winstead, John Goodman, John Gallagher Jr.
Review: Boosted by a bold teaser trailer that left audiences riddled with questions, 2008’s Cloverfield was a fairly genius example of how the right marketing could create all the buzz that was needed to guarantee a healthy debut at the box office. I mean, they didn’t even give the title of the film away…which drove audiences to fire up their Dell laptops and do some old fashioned sleuthin’ to find out more about the found footage flick. Was it a disaster movie? Was it a monster movie? No one really knew until the film was released…and was a bit of a dud in my book. Undone by its hype, the hand-held filmmaking churned my stomach and lackluster plot developments frustrated way more than it frightened. 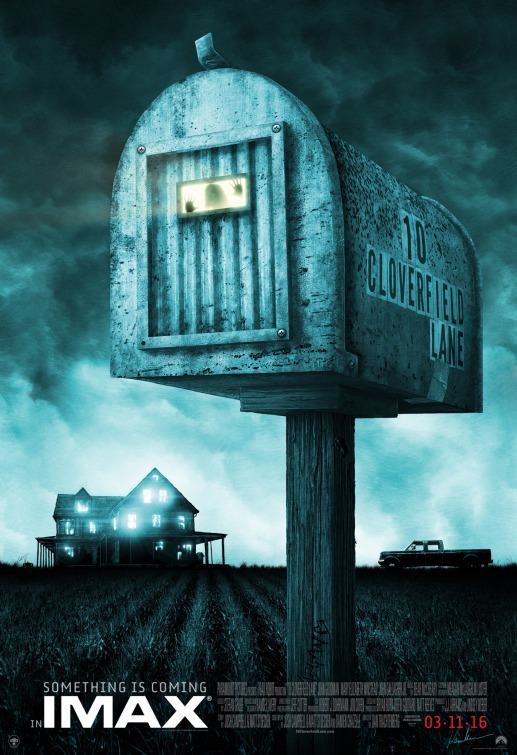 Fast forward to January of 2016 when Paramount revealed the trailer for 10 Cloverfield Lane…a mystery film that somehow managed to fly so far under the radar that even the most tapped in film fans were thrown for a loop. In this day and age of spoiler heavy early reviews, I’d classify that as a not-so-minor miracle…so my first reaction was respect more than anything else. Then I remembered how I felt going into Cloverfield and instantly started to lower my expectations so the buzz bar wouldn’t be raised too high. So…before we go on…it’s next to impossible to talk about 10 Cloverfield Lane without going into certain details that may be considered minor spoilers. I’m going to do my best to keep it vague, but for those sensitive souls out there (you know who you are) tread carefully. Michelle (Mary Elizabeth Winstead, The Spectacular Now) is running away…from what we’re not sure. It could be her heard but not seen boyfriend (listen closely and see if you can pick out his Oscar nominated voice) or it could be life in general…we don’t know and it ultimately doesn’t matter. After being involved in a violent automobile accident, she wakes to find herself chained to a wall in an underground bunker presided over by Howard, a twitchy survivalist (John Goodman, Argo, Flight) that makes sure she knows he’s her savior. There’s a wicked whiff of Misery at play in these early scenes as Michelle comes to terms with her good Samaritan (or captor?) and the rules he has for life under the ground. Why are they holed up there you may ask? Well if you believe Howard there’s been an attack that’s left the world above ground in a desolate state of fallout that will take years to bounce back from. Do you trust Howard, though? That’s the question Michelle and another shelter mate Emmett (John Gallagher, Jr) are troubled by the more time they spend in confinement and the more discrepancies they find in Howard’s version of events. And with that, I think we’re at a good place to stop and let you find out for yourself the truth behind it all. Made for a fifth of the budget of Cloverfield, the $5-million-dollar movie is a handsomely produced bit of entertainment that has its fair share of genuine shocks and out of left field developments. My jaw dropped more than once at what transpires, creating a giddy sense of old school movie-going fun that few films seem interested in tapping into. If there are a few hokey moments, there’s enough good will generated to forgive some sloppy storytelling and iffy effects (though none as dreadful as the ones you’ll find in London Has Fallen) that don’t mar much of the overall experience. With only eight actors listed in the credits, the film simply wouldn’t have worked as well without its cast, namely Goodman, creepy-as-all-get-out without doing much more than giving Winstead a once-over with his eyes. Winstead, nicely plucky as a heroine that isn’t perfectly formed into a cookie-cutter robot is interesting to watch and a viable actress to root for even if we can tell she has some hidden backstory that may make us like her less if the situation was different. First time director Dan Trachtenberg keeps the film racing along (the first time I checked my watch was 95 minutes in) in a most agreeable way, aided by Bear McCreary’s (Europa Report) pounding score. The first 15 or so minutes of the film are dialogue-free, leaving McCreary’s music to tell the story and ratchet up the suspense for the remainder of the running time. The score is almost a character in and of itself. My best advice for you would be to go into 10 Cloverfield Lane with as little information as possible…you’ve come to the end of this review so you’re already clued in a bit but trust that I’ve saved the twists and turns of the movie for you to enjoy on your own. A far superior effort than Cloverfield (though, to be fair, they are two totally different pictures), 10 Cloverfield Lane is worth a stroll.